Does anyone have holster suitable for the Pixel 2. I have switched to Android after 10years of iPhone and I am used to Seideo holsters. Unfortunately they don’t have anything for the Pixel 2. I am looking for a belt clip holster for the non-cased Pixel 2. I have a pixel 2 xl. I bought yet again the otterbox defender which has a holder with it. I usually rave about these cases however there is no screen protector and the case only accepts the phone one way. being right handed the phone is backwards for me when I unclipped it. Here's what I've done in the past. Since the buttons on most phones are towards the upper half of the phone this usually works. I find several phones of the approximate same size, and order the holster designed for those, and then return the ones that didn't fit. I am looking for the same.. With the OG 5" Pixel the Galaxy S6 Holster was almost a perfect fit. OP have you found one that will work? Problem is that Seidio is not making the naked holsters for very many phones these days.. I've been on the hunt and there is not much close to the 5" Pixel 2 size that Seidio makes a spring clip holster for. I found the HTC One M9 to be close.. 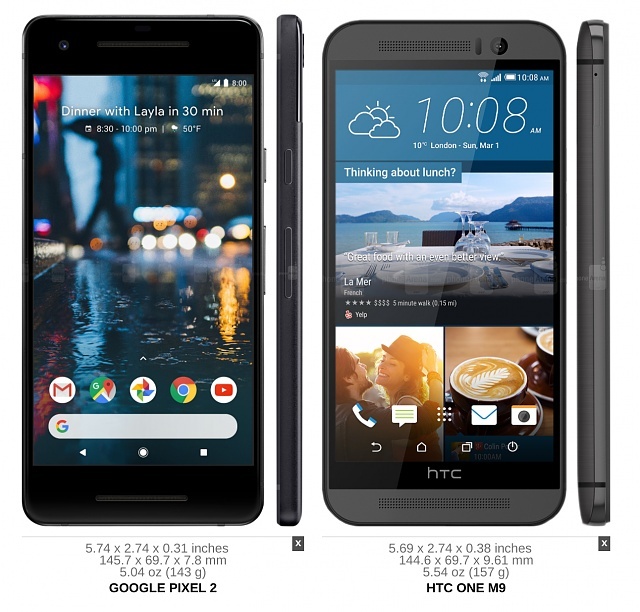 The Pixel 2 is about 1 mm taller, same width and the HTC is almost 2 mm thicker. Amazon had a warehouse deal on an M9 holster for $7 so I snagged it. It should be here Tuesday so I'll report back. I think the Blackberry Keyone holster may also be a candidate with a few corner bumpers on the insice to snug the phone in the extra space available. HTC M9 looks more promising though. My M9 Holster is suppose to be here today so I'll let you know. I think it's going to work fine. The only issue I can foresee is maybe to much area at the bottom since the M9 is thicker. I had this happen with a different phone a few years ago and the easy solution (if that's the only problem) was to add a thin strip of velcro or a thin rubber strip glued to the bottom area. This solved my problem with the other phone that fit perfectly other than the width at the bottom. I'll snap some photos after it arrives and post them up. Even though the M9 is thicker then Pixel 2 will not slide all the way down into the bottom. I believe this is due to the thick plastic band that runs down the inside of the holster to adjust for the M9's rounded corners. I slightly modified mine by bending the bottom clips outward a little and the Pixel 2 now fits snugly.. There is one issue even now and that's that the top clip does not spring over the top of the phone automatically. To get the Pixel 2 in the holster I need to seat the bottom then lift the top clip and seat the Pixel 2. The Keyone holster probably won't work as looking at it's distentions, it's 4 mm taller than the Pixel 2. I am going to keep using my rigged up M9 holster for now but I'll stay on the hunt for a better option. Any pictures? Should help us a lot. I've successfully used little pieces of self-adhesive felt on the inside or bottom of a holster that was slightly too large. The 1st photo I zoomed in on shows the issue that prevents it from seating all the way down into the bottom. Slightly prying the bottom clips outward does help a bit but it's still not an optimal fit. At this point I'd say we are stuck trying to find something in their Surface lineup that will work. We would need a Surface holster from a smaller sized phone as that line is made to be used with their case. The Surface line of holsters would be taller and wider than the actual phone it's made for. Seidio does not list dimensions so finding one that will work is going to be difficult. Digging into the Seidio cases I see they state that the Surface cases add 2mm of thickness so I assume that means the Surface holster will be 2mm wider and taller. I used a S6 Clip Holster for my OG Pixel and it was a perfect fit. Assuming the Surface adds 2 mm in width and height to the holster then either of the above *might* work. In this case I'd say the OG Pixel Surface Holster would be the better bet. I am going to hunt for a good deal on one and if I find it I'll snag one and report back.. I've also noticed the lack of holster case combos with the Pixel 2. Odd. Perhaps because of the "squeeze" function ? Flicked via the BlackBerry keyboard on my Pixel 2. I am due for an upgrade and really want the Pixel, but the lack of a naked holster is holding me back. I just hate the bulk that even the thin cases add to a phone. Quoting myself with an update.. I found a user on another forum who has the Pixel 1 Surface holster and a Pixel 2.. He tried the Pixel 2 naked in the Pixel 1 Surface holster and reported back that's its a no-go and not even a close fit..
You can always go for the BlackBerry PRIV leather holster. That what I use with this official Pixel 2 case. I have always used turtleback holsters for all of my devices great fit and great company to deal with.